For many bodybuilders, developing big, muscular calves is a challenge. They find that calf training is arduous, frustrating and unproductive. Of course, there are some genetically gifted individuals that have naturally big calves and don’t need to train them hard. However, if you’re reading this article, that’s probably not you. 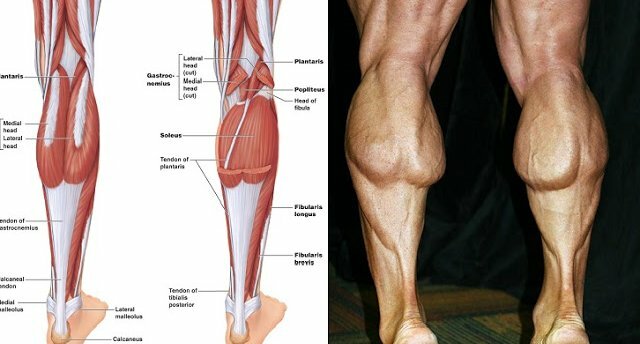 If you’re typical, then you’re probably wondering why your traditional calf training has failed and why you haven’t been able to build huge, diamond-shaped calves like the pro bodybuilders. Well, I’ll give you four reasons. Of course, I don’t know how you train. Therefore, some of the reasons I’ll be giving may not apply to you. However, you’ll probably see a little (or a lot) of truth in each of the following reasons. 1. Using The Wrong Repetition Range – If you’re training your calves in the traditional 8-12 repetition range, then you’re only stimulating your Fast Twitch muscle fibers and ignoring the Slow Twitch muscle fibers. The calf muscle group is composed of two major muscles – the Soleus and the Gastrocnemius. The Soleus, which is about 60% of your total calf mass, is composed of 80-90% Slow Twitch fiber. Slow Twitch muscle fibers respond better to higher repetitions in the 20-100 range. The Gastrocnemius is composed of approximately 50% Fast Twitch and 50% Slow Twitch muscle fibers. Therefore, the Gastrocnemius can be trained best by incorporating half the training in the 8-20 repetition range and the other half in the 20-100 repetition range. Therefore, to thoroughly stimulate your calf muscles to grow, use both repetition ranges as mentioned above. 2. Range of Motion Is Too Short – Often, I see bodybuilders using a very short range of motion while training their calves. Usually, this range is 1-2 inches, when it could easily be double that range. All calf raises should start from an extreme deep stretch at the bottom and finish with a peak contraction position at the top of the movement. The full range of motion gives you more “time under tension”. The longer a muscle is under tension, the higher the stimulation. This additional stimulation will induce more muscle fiber growth. 3. Lack of Variation In Routine – The calves are a dense, tough muscle group that’s designed to withstand activities such as standing, jumping, walking, jogging, running, or sprinting. The calf muscles are designed to handle heavy endurance activities without fatiguing. The calves also become accustomed to the same training routine and will cease to grow. To stimulate more calf muscle growth, you must “keep the muscles” guessing. This means using different calf exercises such as Standing Calf Raises, Seated Calf Raises, Toe Presses on Leg Press Machine, Donkey Calf Raises every workout. In addition, you must different exercise techniques besides Straight Sets such as Rest-Pause Sets and Drop Sets. And, of course, you must vary your repetition ranges as discussed above in Item 1. 4. Lack of Flexibility – During our daily activities, our calves rarely experience a full range of motion. As a result, the muscles, joints, and tendons become less flexible. To increase your calf flexibility, deep stretching must be done after each calf raise set. Stretch the calves for 30-60 seconds. The increased flexibility will improve your range of motion.